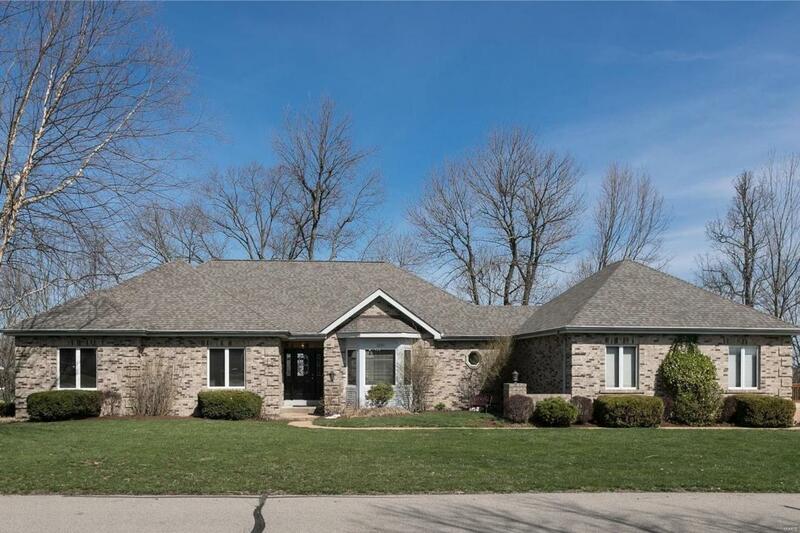 Beautiful (4BR/3.5BTH, 3-car garage) ranch home with spectacular views overlooking the 10th green of Sugar Creek Golf Course! ** Over 4,000 Sq ft of total living space - an entertainers dream! ** Straight ahead of the large entry foyer is an expansive great room with vaulted ceiling, fireplace & windows. The large entry foyer features a custom wood staircase leading to the lower level. To the right of entry foyer is a beautiful formal dining room with bay window, and to the left is a light-filled executive office with built-in bookcases & wood-paneled pocket doors. The Large center-island kitchen with breakfast room features an expansive bay window & side windows that provide not only sunlight, but a view of the golf course & the 19' x 22' deck! The lower level has an enormous recreation room with fireplace #2, a fitness room, full bath, 4th Bedroom, & a walkout to a lovely patio. The impressive tree-lined backyard has a beautiful 1-year-old retaining wall. This home is truly a RETREAT!